Published: April 16, 2013 at 04:00 p.m. Updated: April 23, 2013 at 09:25 a.m.
Whitney Hand was a surprise third-round selection by the WNBA Silver Spurs in Monday’s draft. 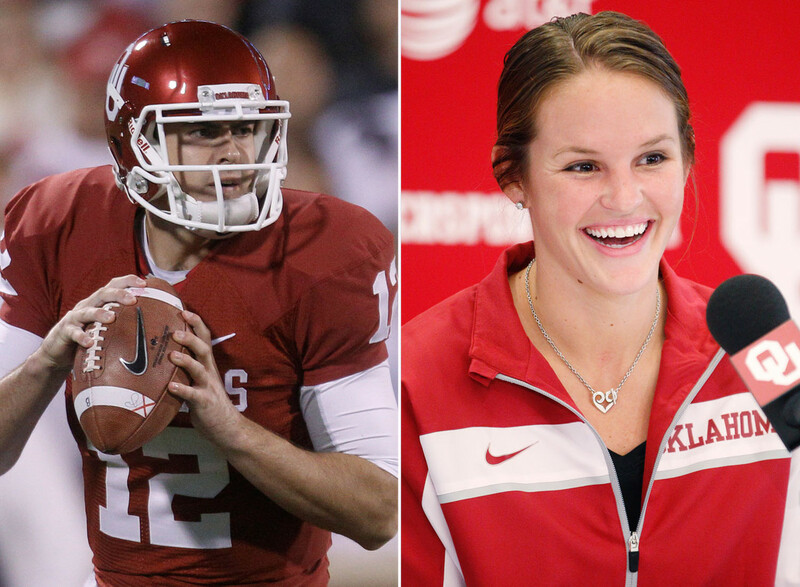 Hand, you might not be aware, is the wife of NFL prospect Landry Jones. When Jones is drafted, the duo will join a list of the NFL’s elite power couples. Jones was nearly bred to be a football player, as he was named after legendary coach of the Dallas Cowboys, Tom Landry. Jones is expected to be selected in the 2013 NFL Draft. He is married to former University of Oklahoma basketball player, Hand. Former NFL receiver Conway and prize fighter Ali have been married since 2007. Conway last played in the NFL in 2004 and has since become a broadcaster. Ali hung up the gloves in 2007. Ross married Richards back in 2010. Ross has won a pair of Super Bowls with the New York Giants, but he's going to need to put in some extra work if he wants to catch his wife who won four gold medals in the Olympics. The journeyman NFL quarterback married Mitts in 2010. Mitts is a three-time Olympic gold medalist as a member of the U.S. women's soccer team. Luck's long-time girlfriend is former Stanford gymnast Pechanec. So not only are they obviously athletic, but very scholarly as well. The newest quarterback of the Seahawks made headlines in 2011 when he flew all the way to Japan to be by the side of Sacramone as she was undergoing surgery.